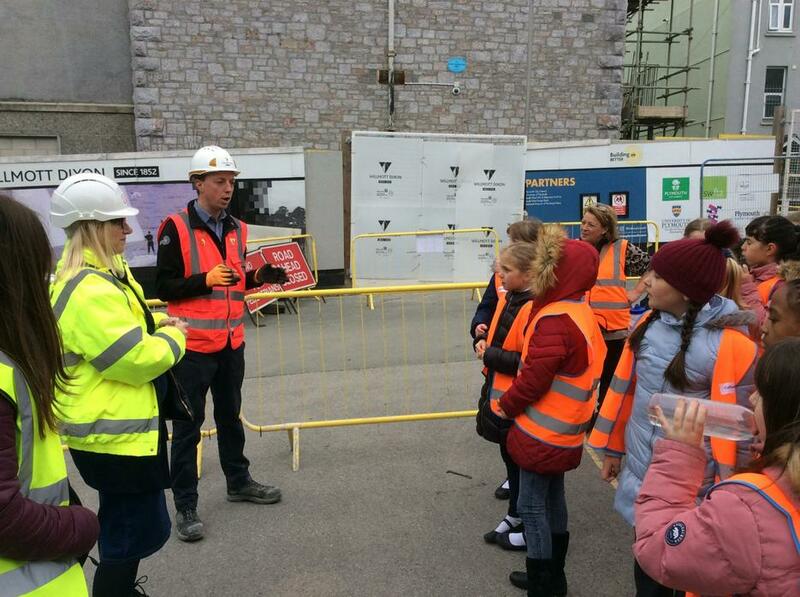 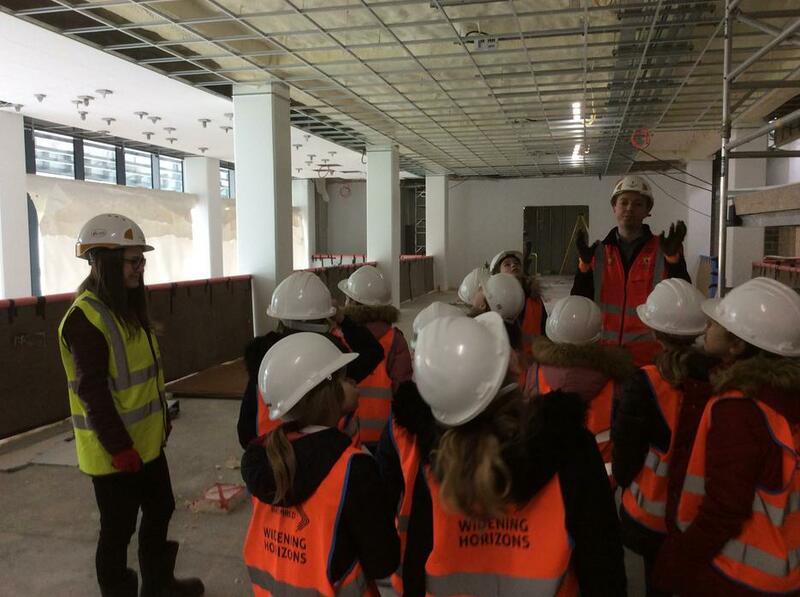 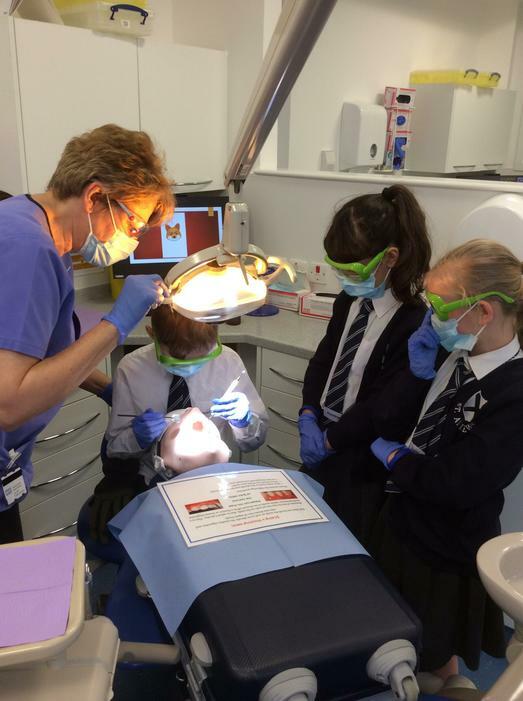 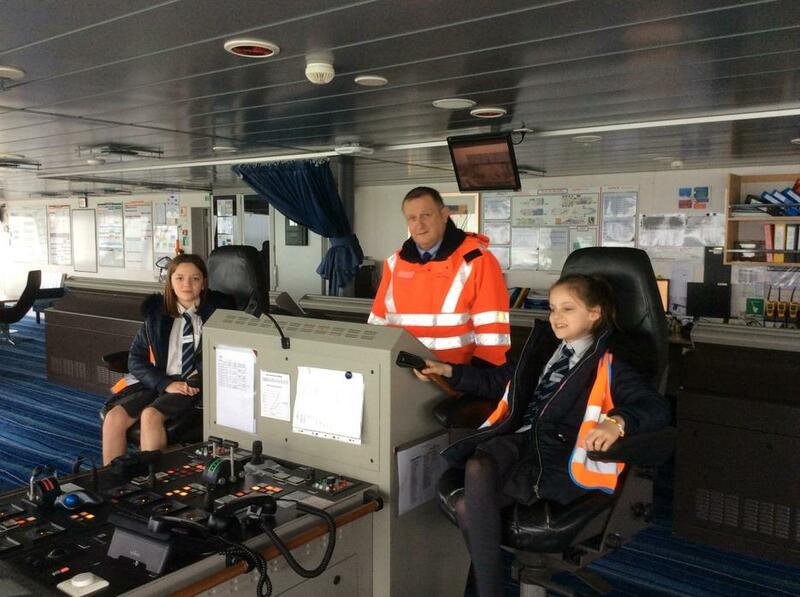 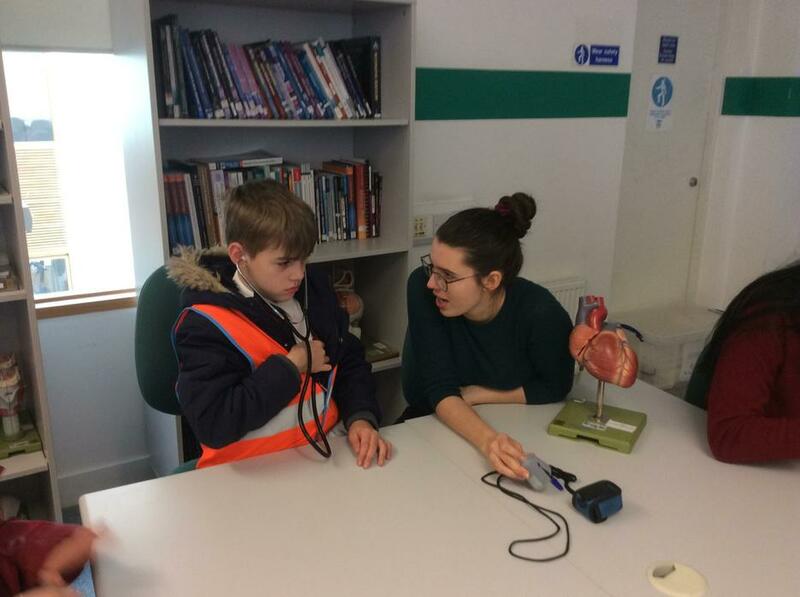 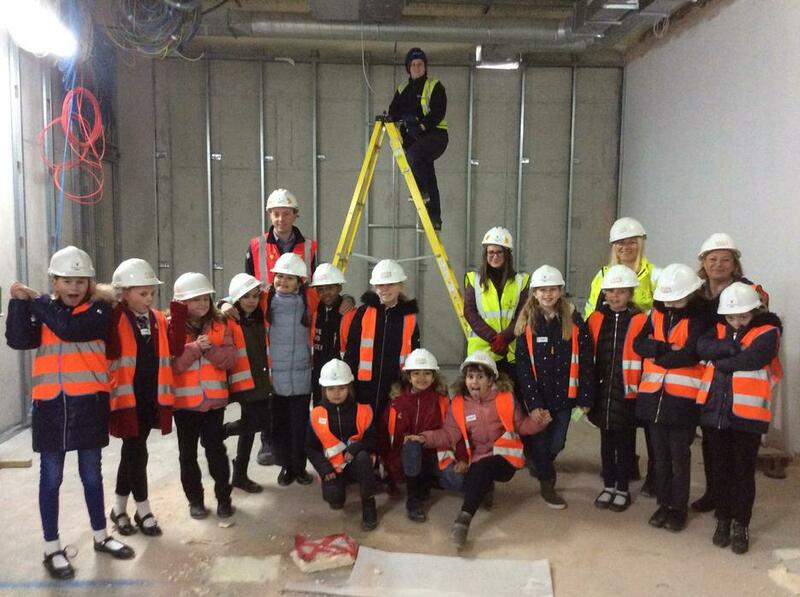 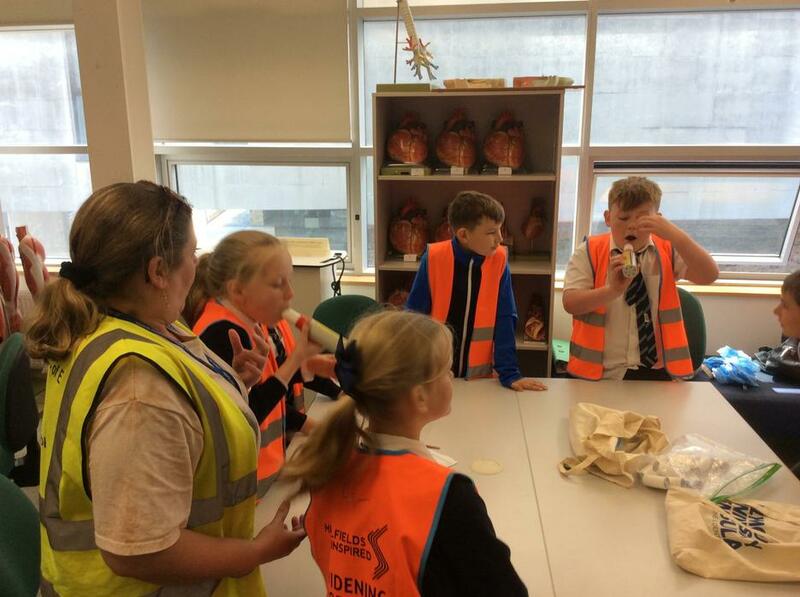 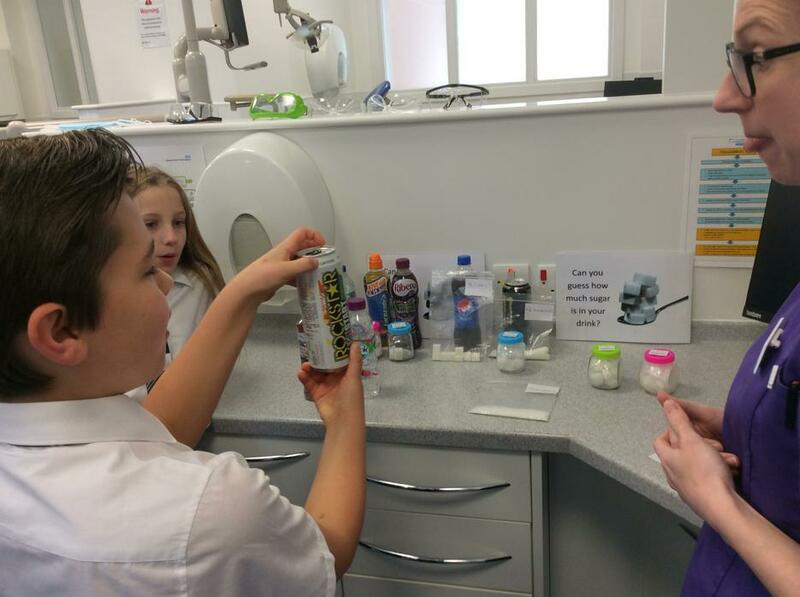 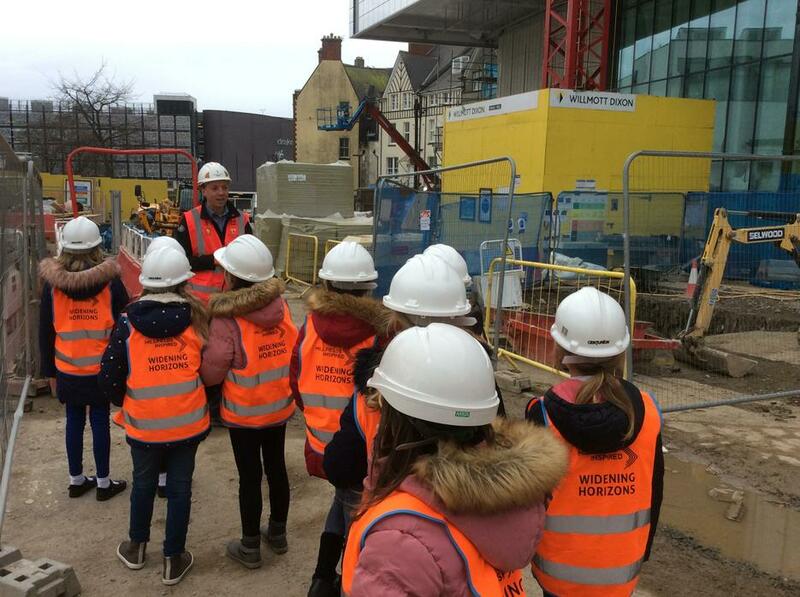 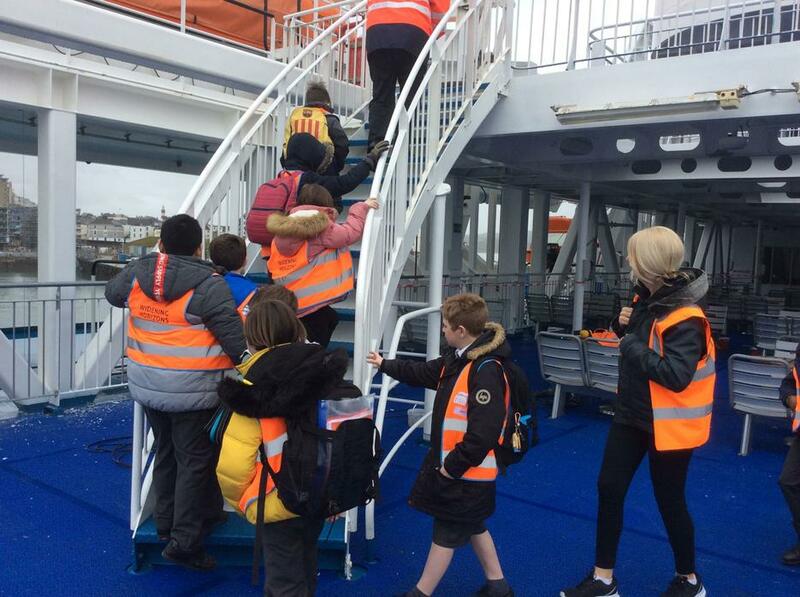 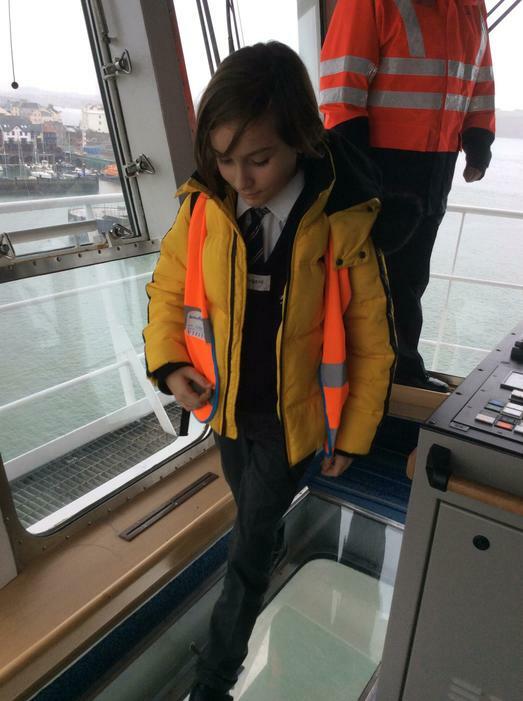 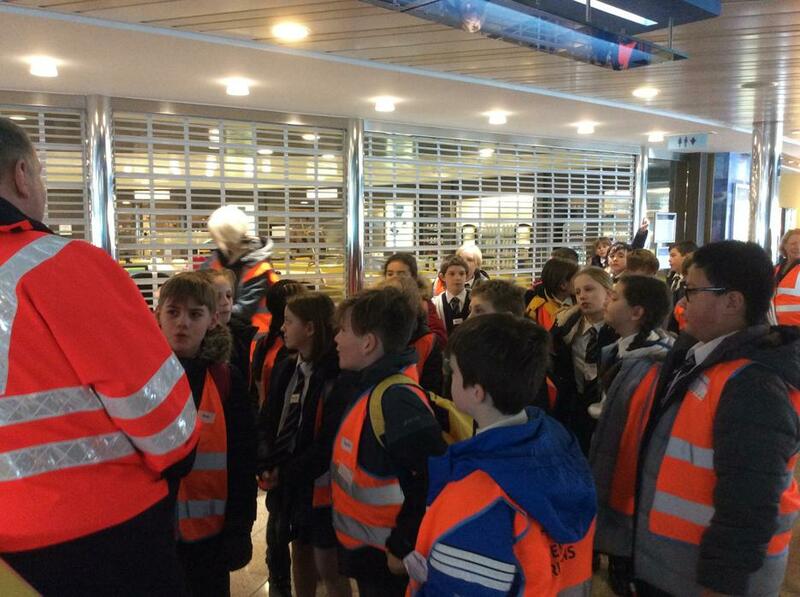 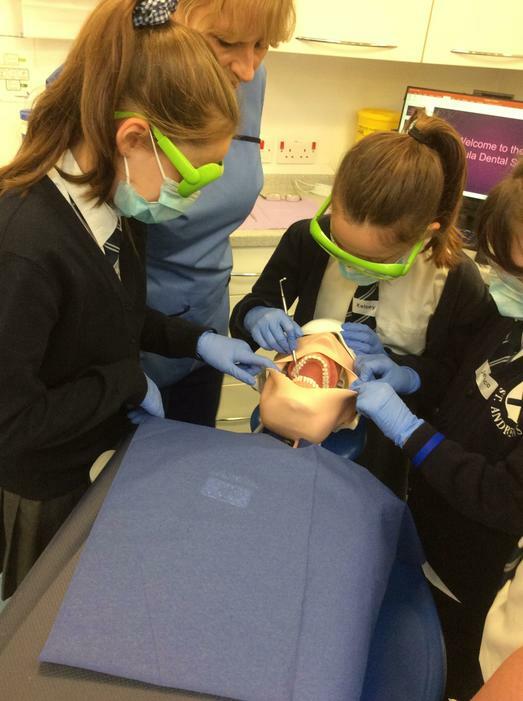 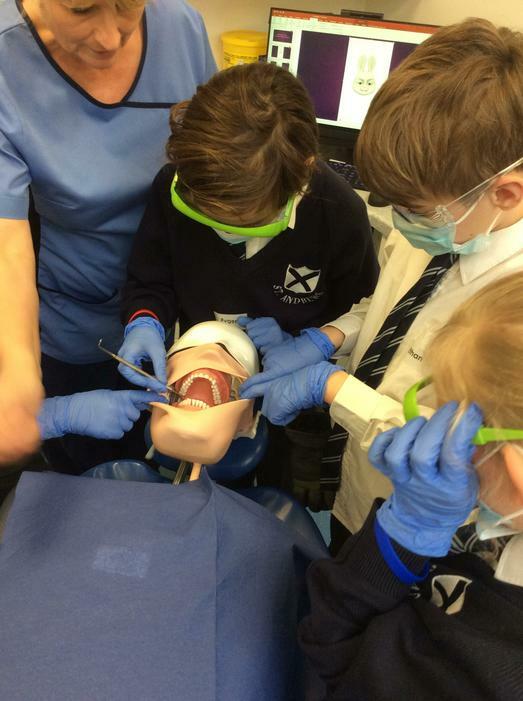 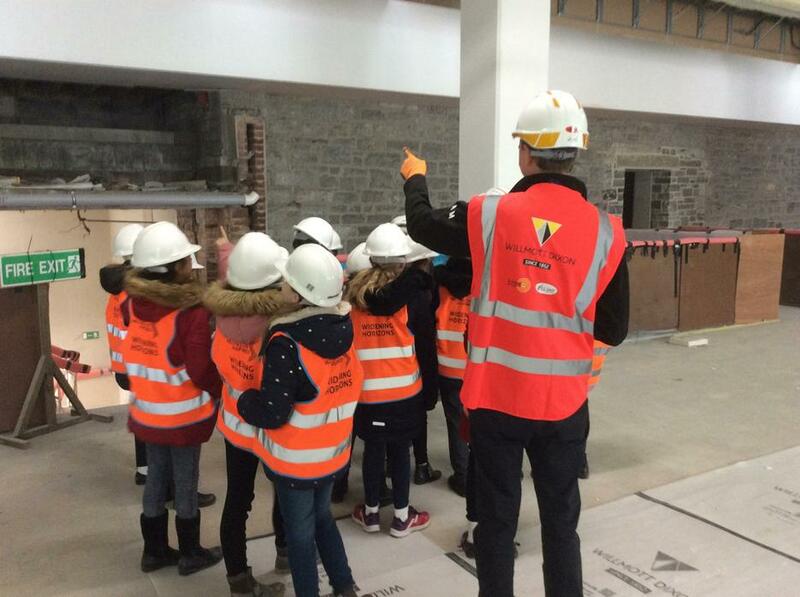 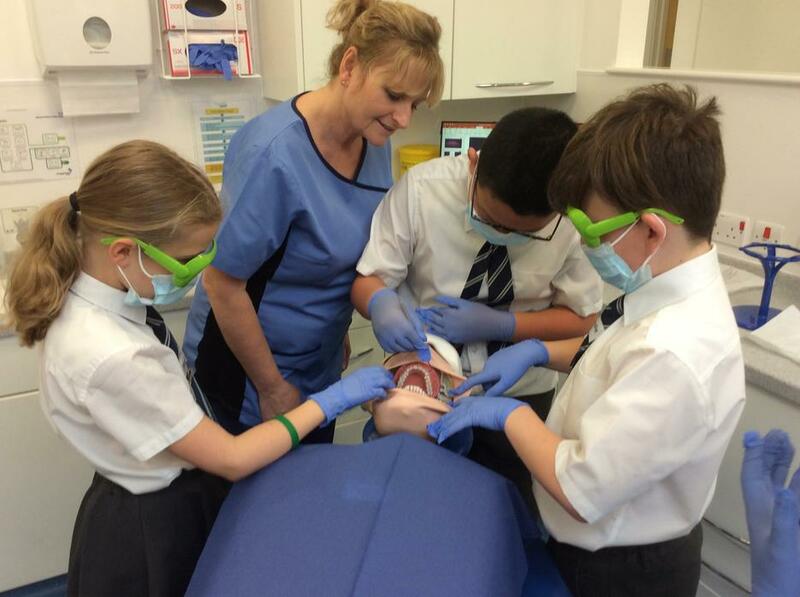 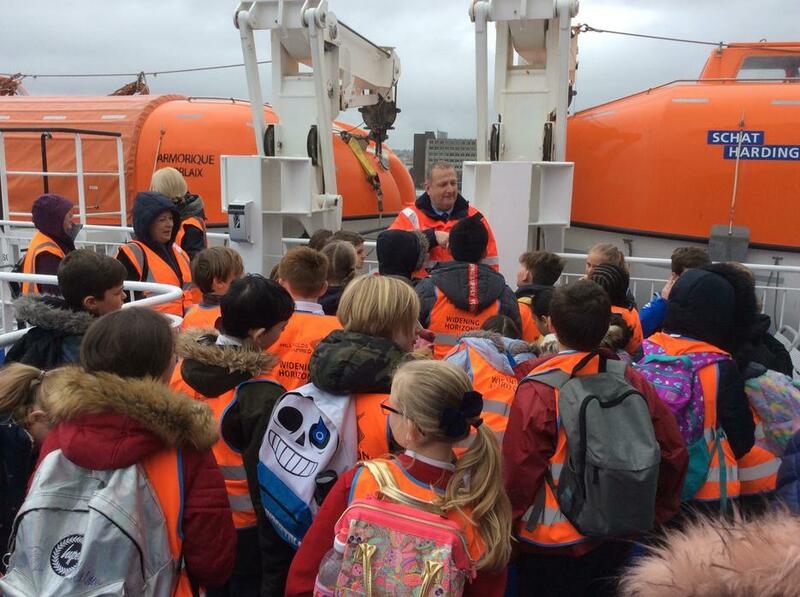 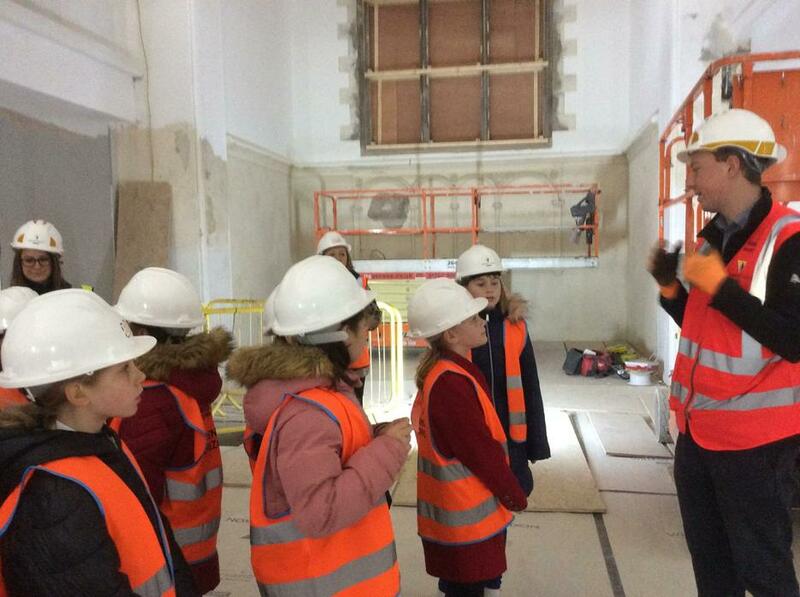 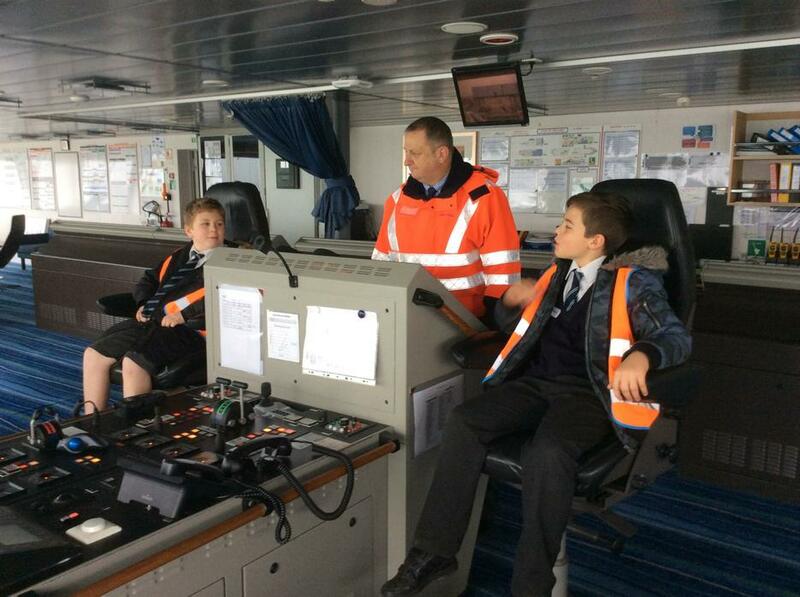 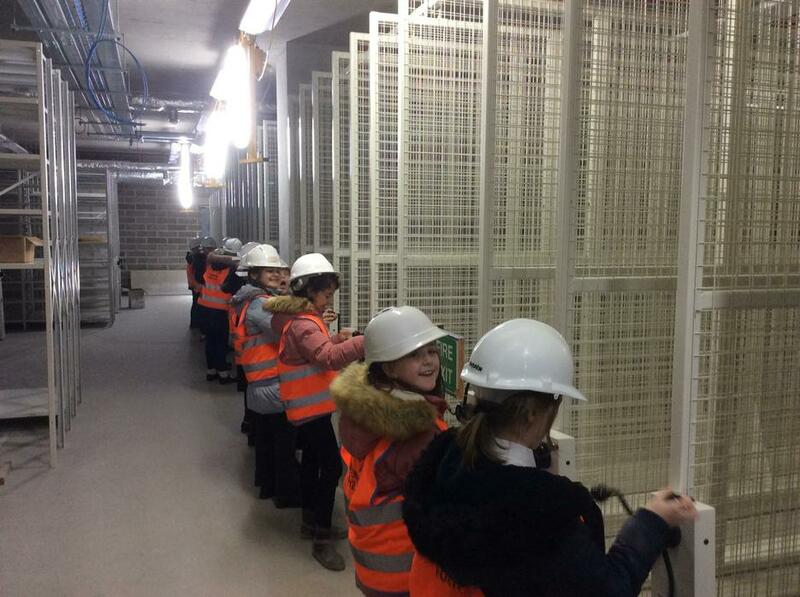 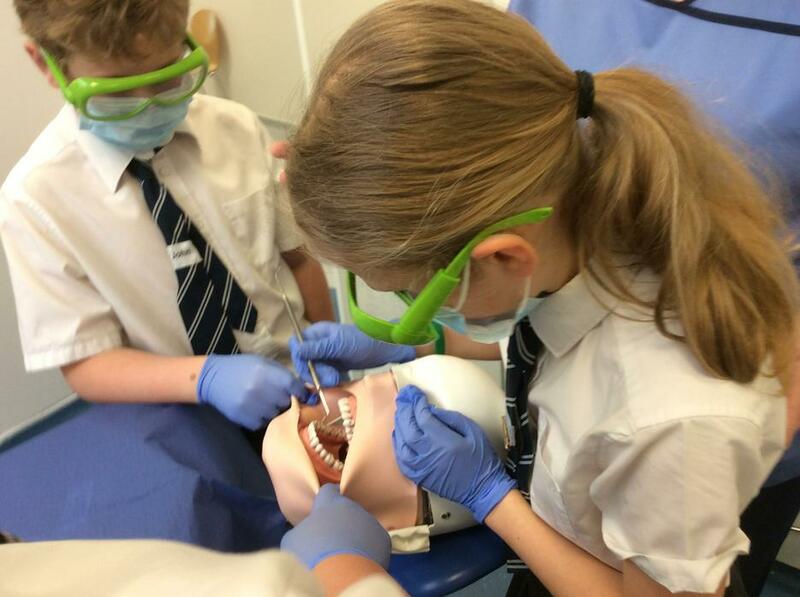 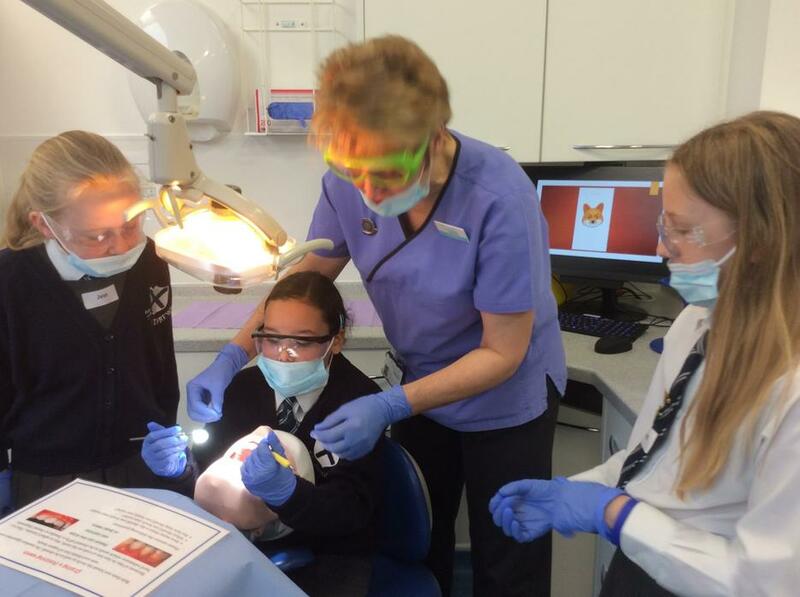 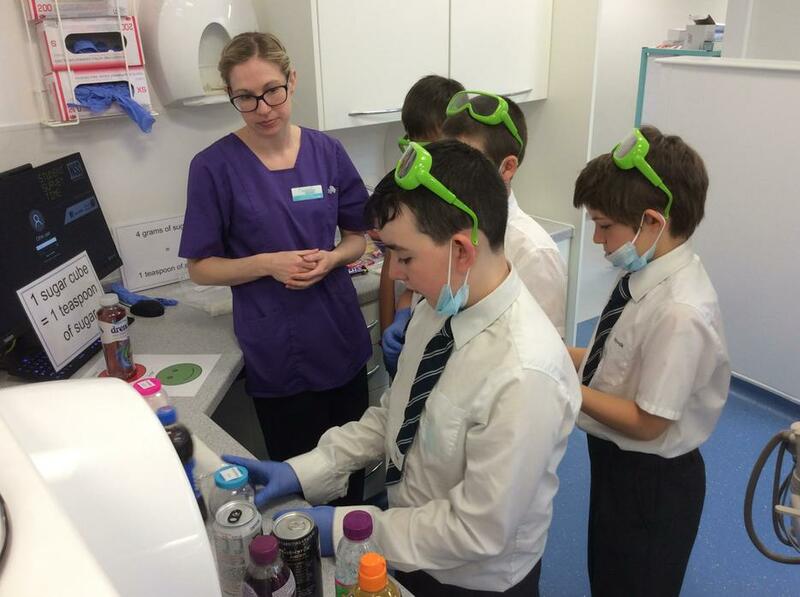 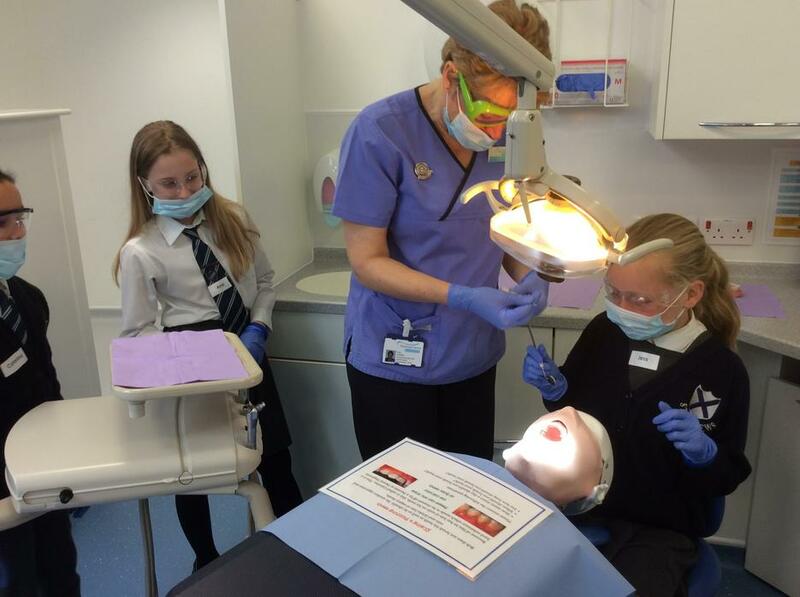 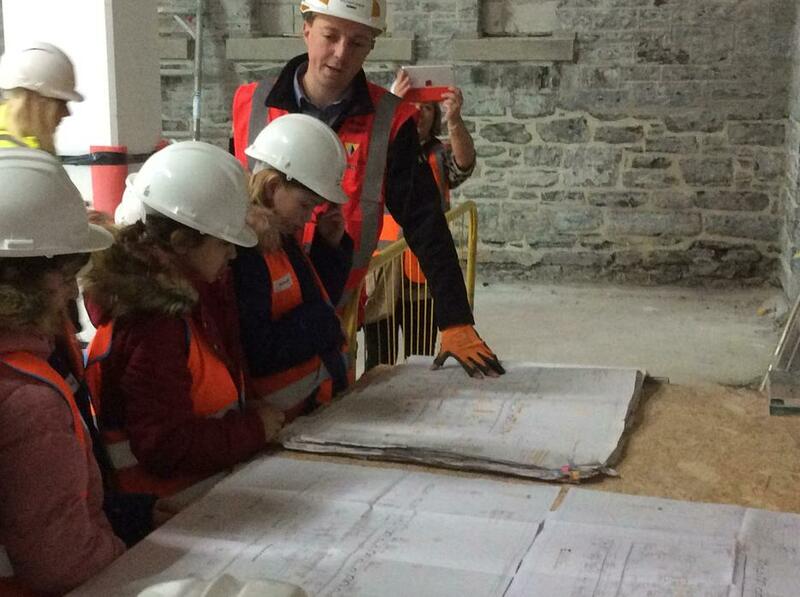 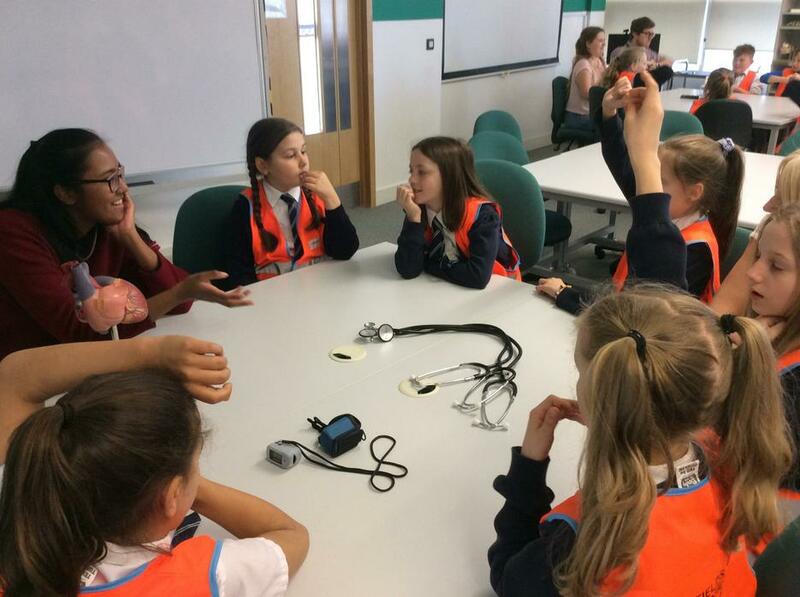 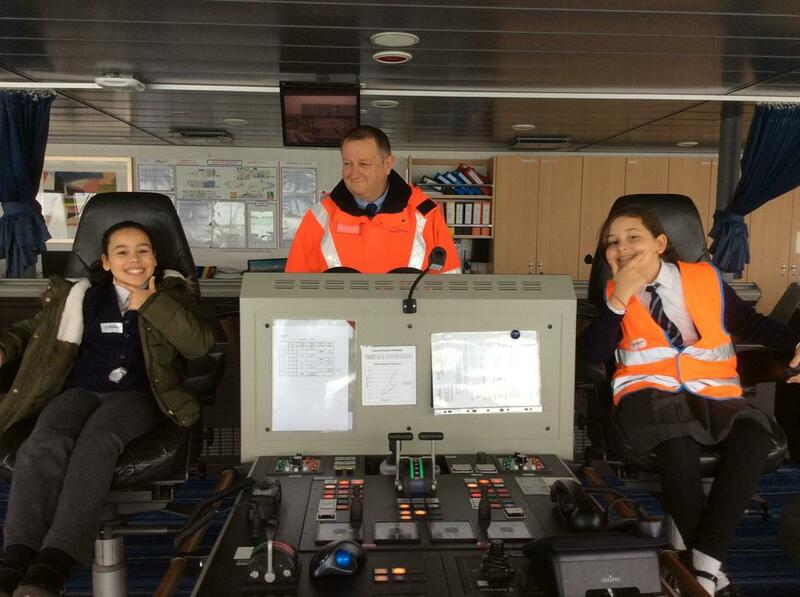 Year 5 have engaged on a wide range of local field trips and activities; to explore the many different working environments and job roles that may inspire their own future careers. 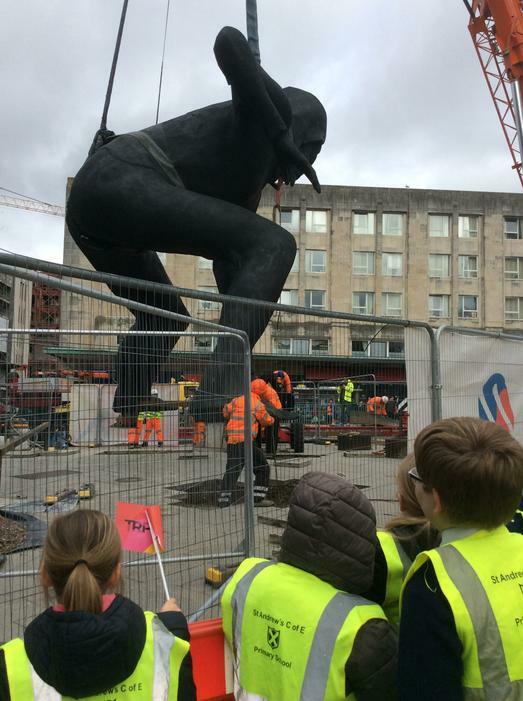 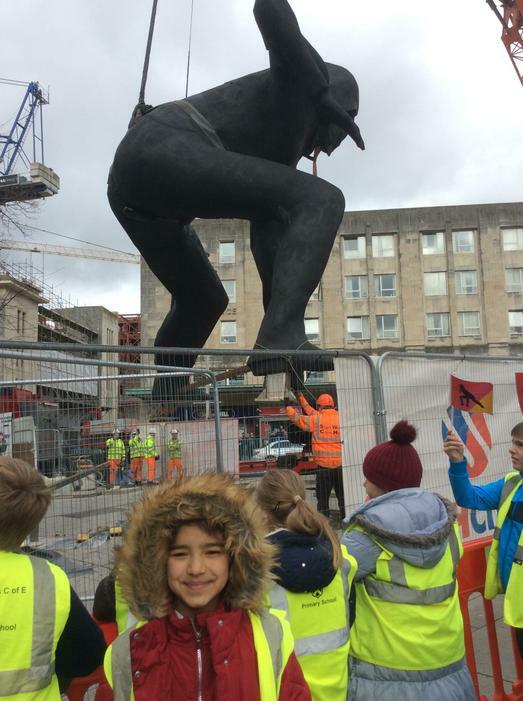 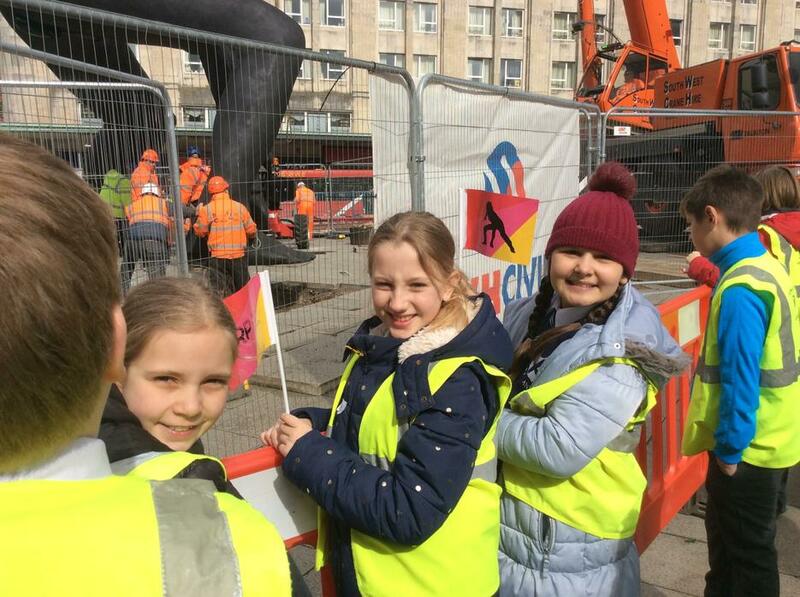 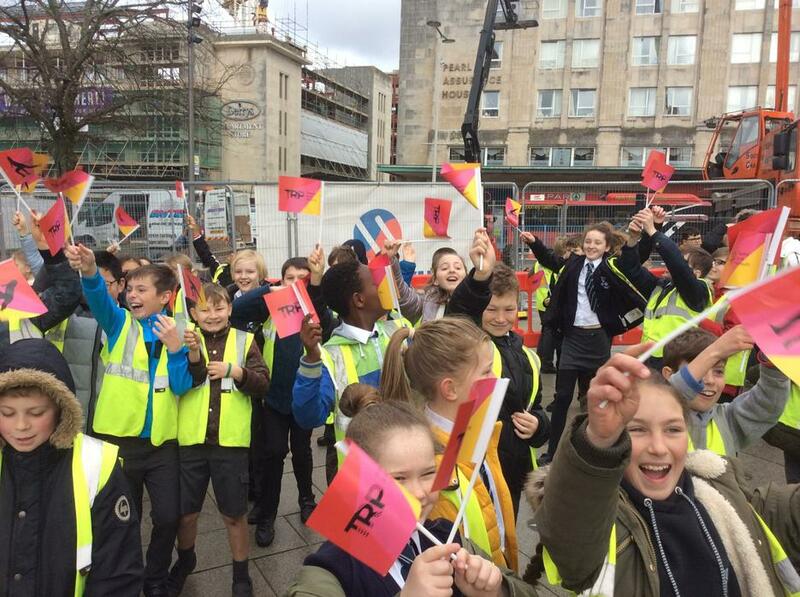 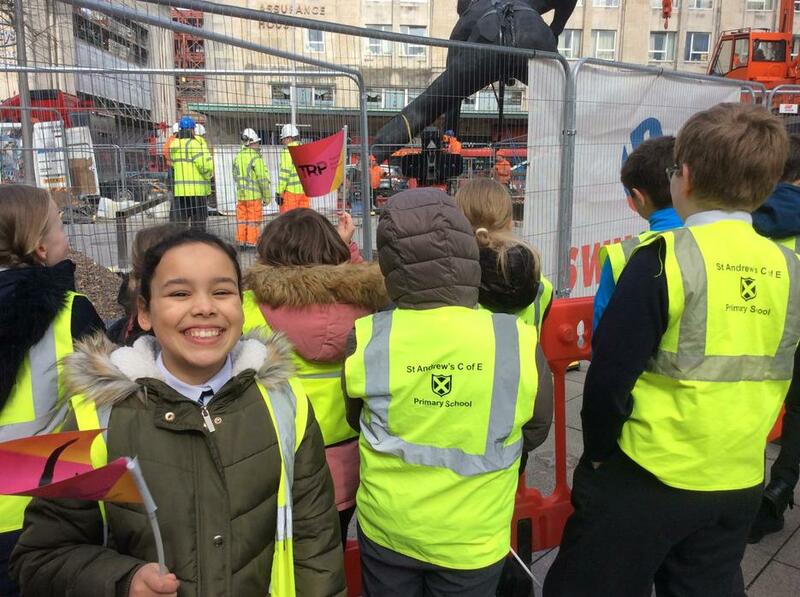 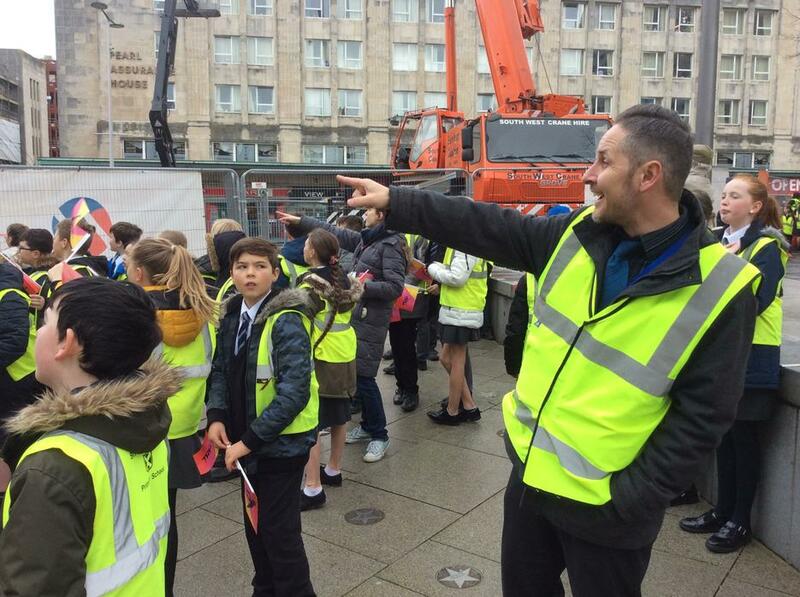 During Term 4, Our class together with Year 6, had the privilege of witnessing the installation of the enormous new bronze sculpture outside Plymouth's Theatre Royal. 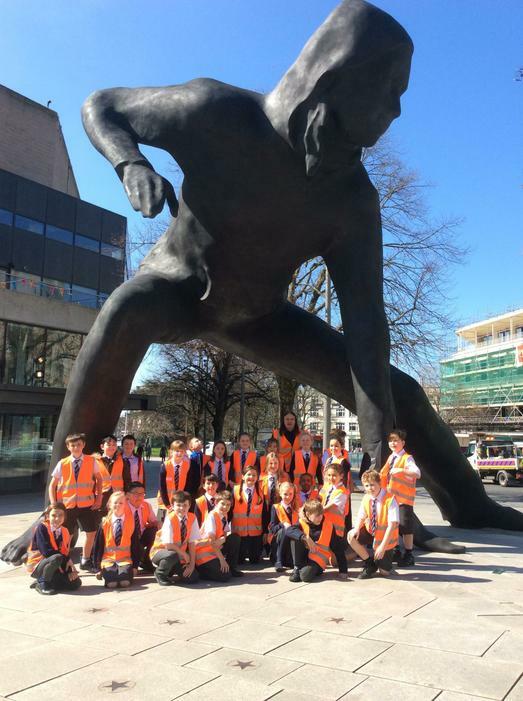 Taking in the atmosphere and the children's first impressions, the Messenger, which stands at over seven metres tall, has since inspired some reflective and creative writing bac k in class, exploring abstract nouns to express their opinions. 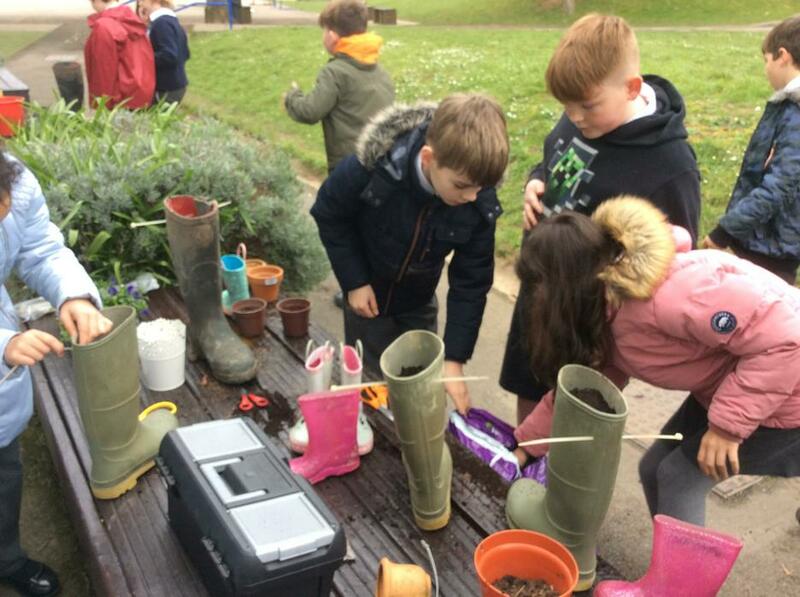 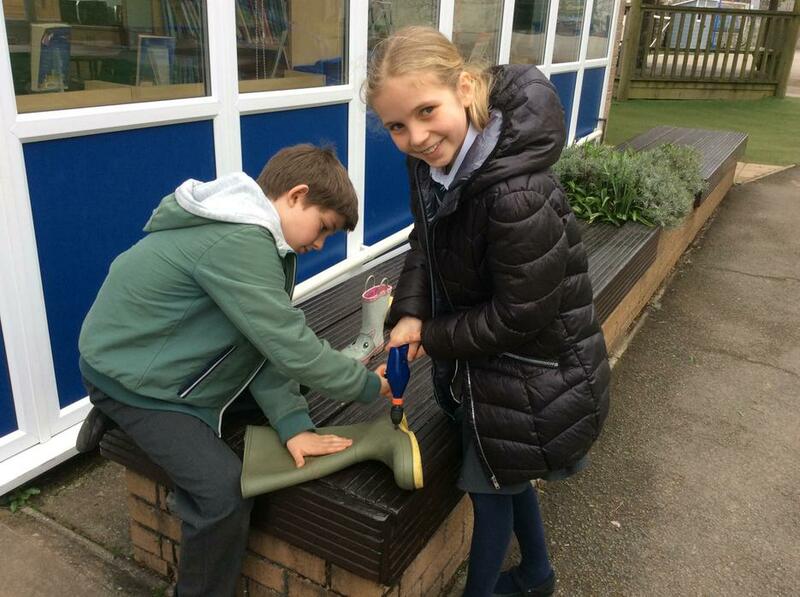 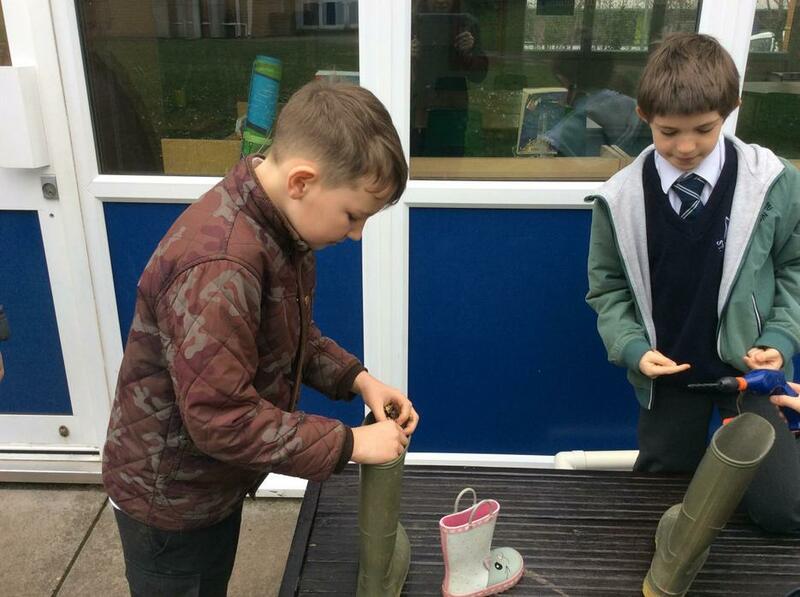 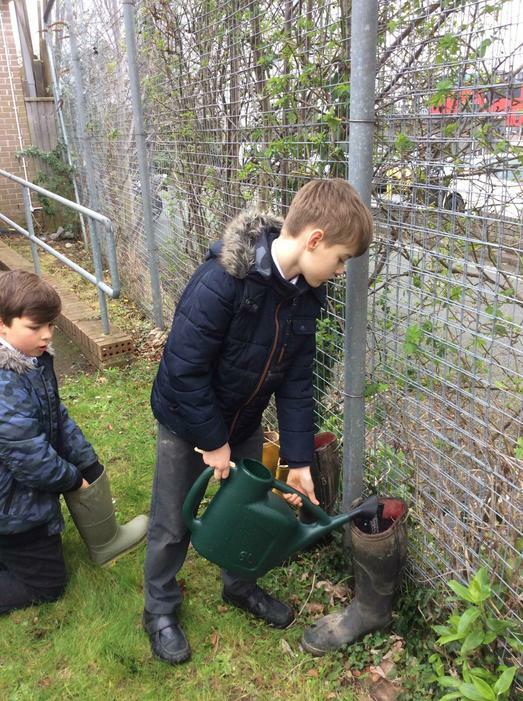 Year 5 began planting a variety of flower and vegetables seeds into various recycled planters, including old donated wellie boots. 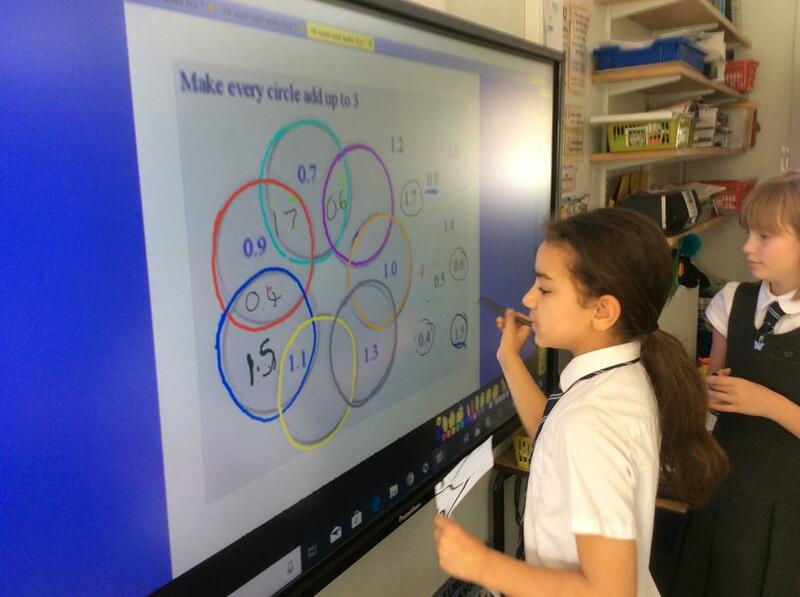 In Maths, we have combined oracy with our knowledge of place value and number bonds, then applied them to a reasoning and problem solving task regarding decimals. 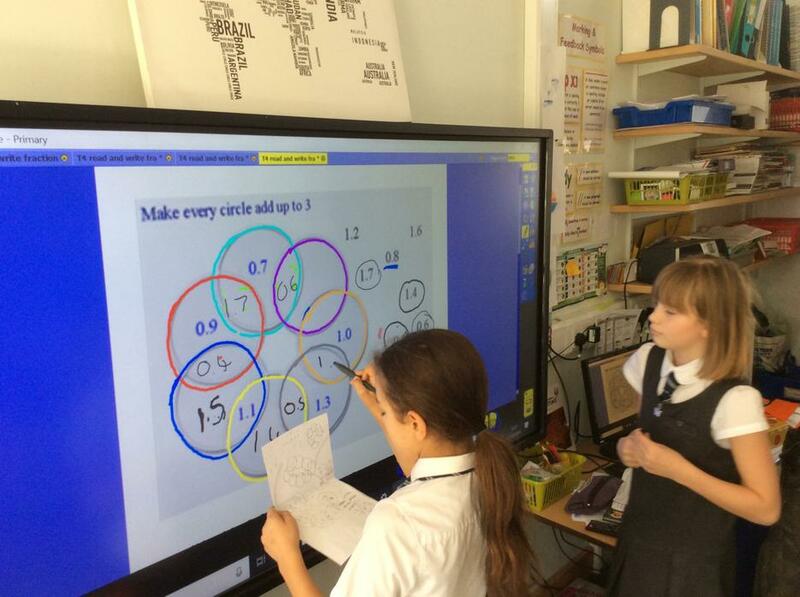 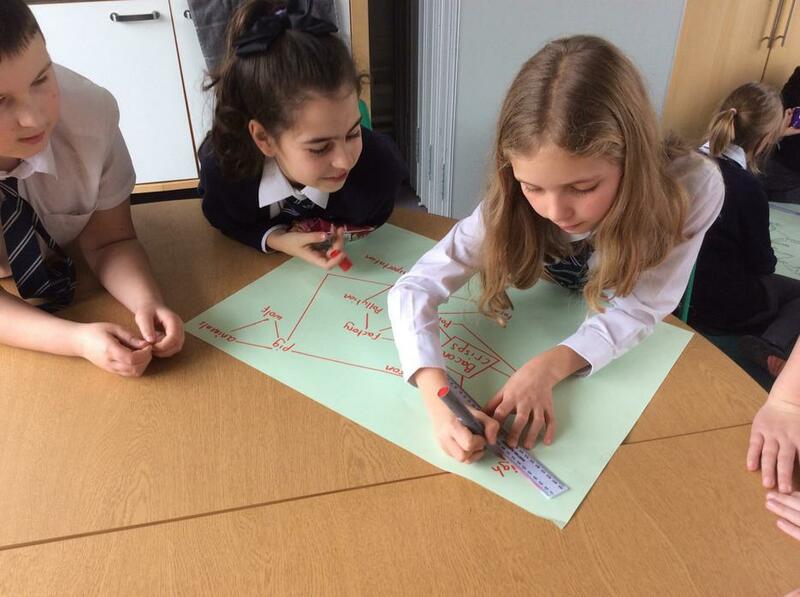 Similarly, using virtual bars of chocolate and biscuits, the pupils tested their understanding of how a fraction of a whole number, and its true value, can be determined by how many parts it is shared with. 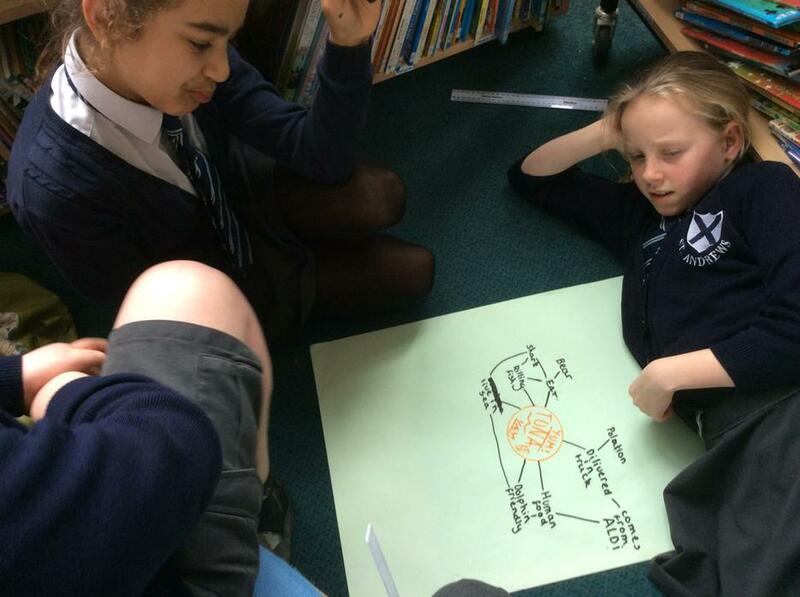 In RE, whilst exploring Buddhism, we have discussed the concept of Interdependence, where 'everything is linked'. 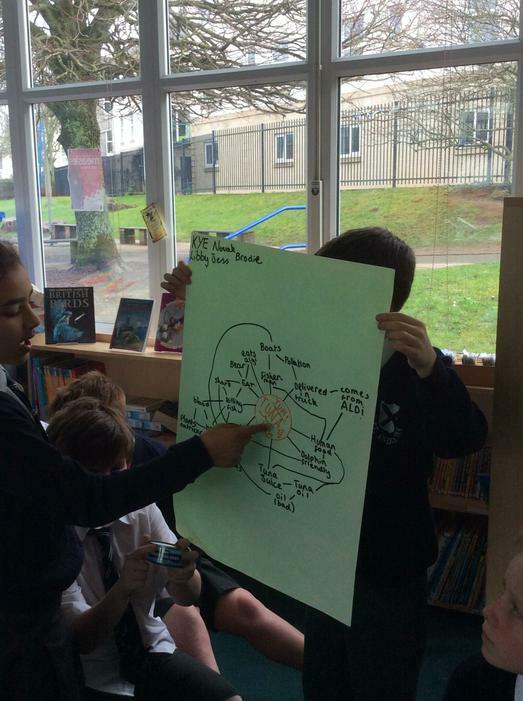 In groups, children have considered and presented their opinions and findings both orally and as a web of connections, to convey just how one single item or action can affect us all; mankind's uses, the jobs we do, the environment around us, food chains, relationships, our well-being, etc. 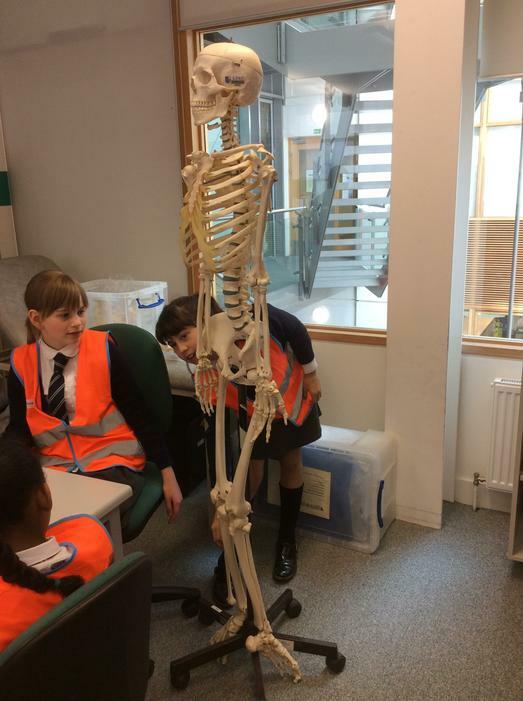 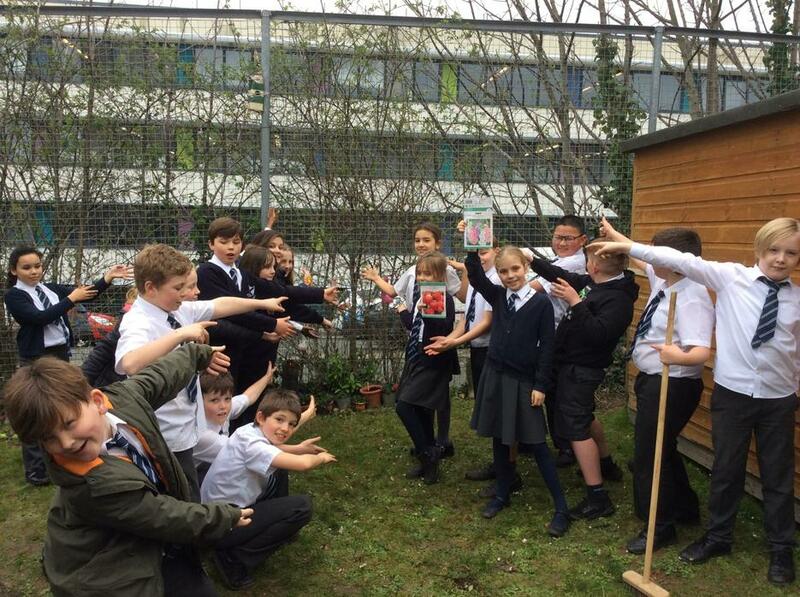 In science, the pupils have justified their observations and logical thoughts during a lesson on Inheritance, to consider what physical and natural characteristics are inherited from parent to offspring through genes, compared to what is learnt and adapted according to the environment and nurturing. 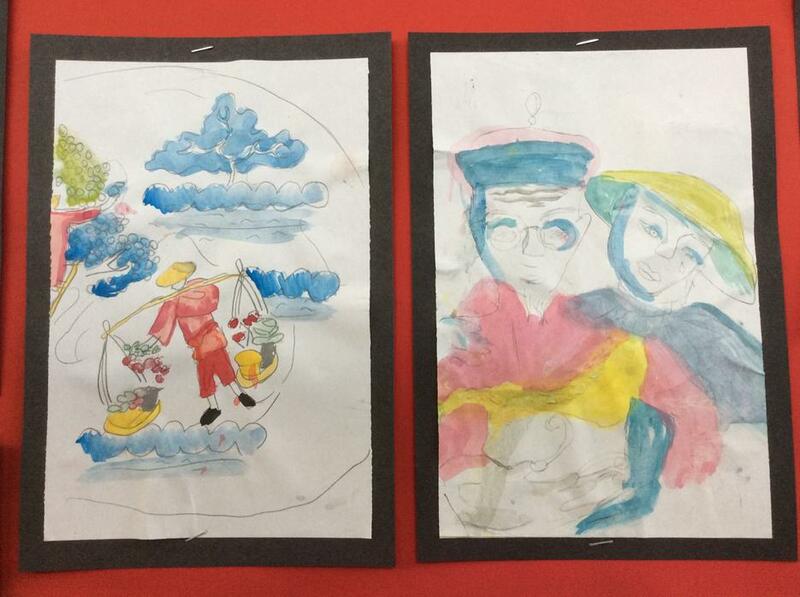 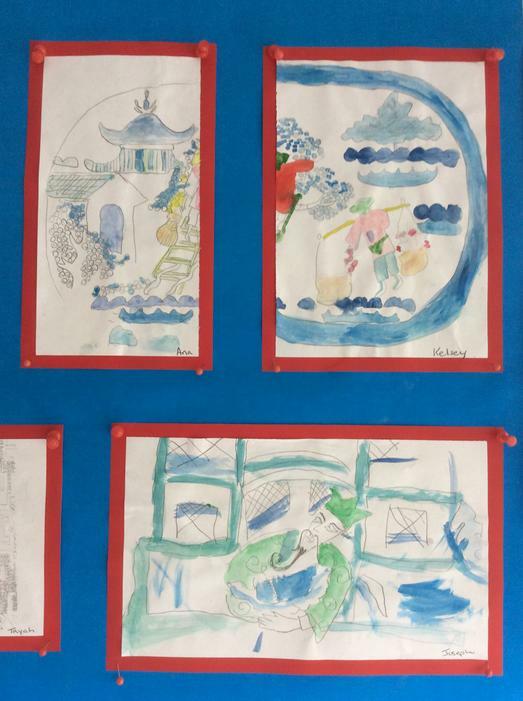 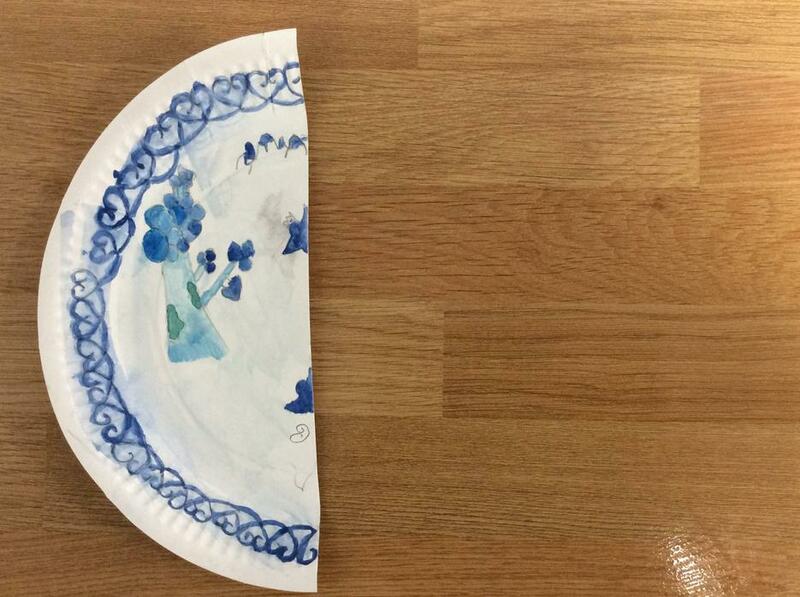 In Art, closely linked to The Willow Pattern Story, that we have studied in Literacy, our class has recreated artwork based on traditional Chinese plate designs, through observational freehand, traced and mirrored sketching and painting skills. 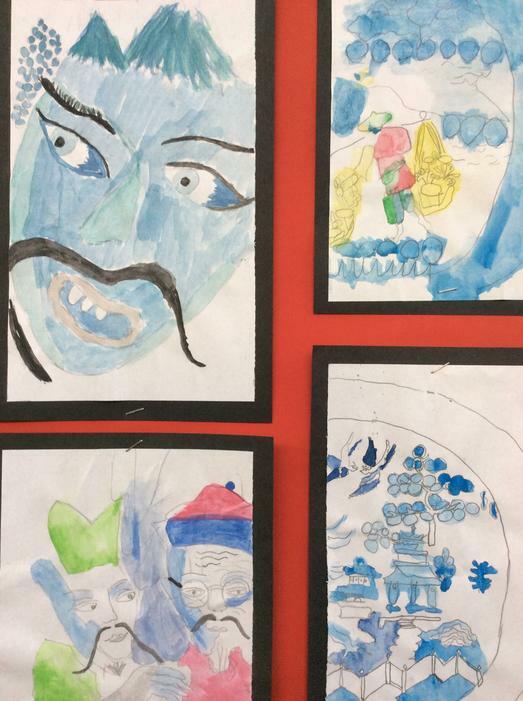 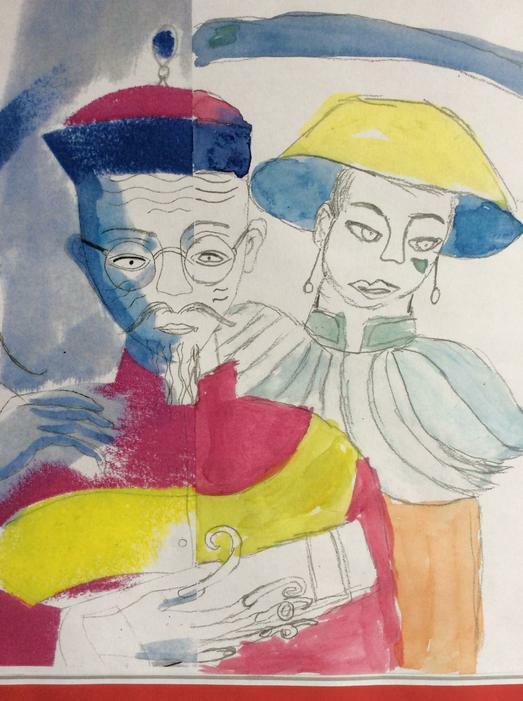 During this spring term, Year 5 will be taking their learning both near and far, embracing our latest creative curriculum topic'The Winds of Change', where they will unearth the distant past of the Chinese 'Shang Dynasty' and embrace the cultural legacy it left behind. 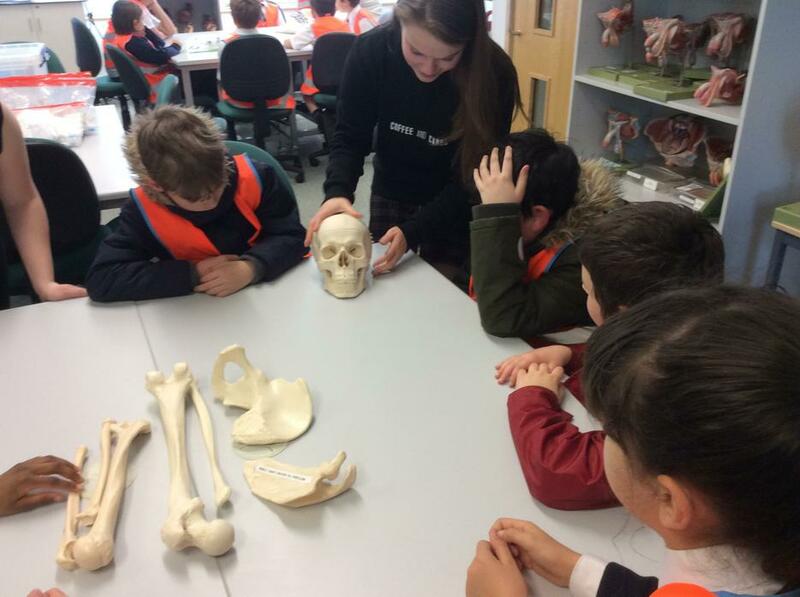 Meanwhile, closer to home, our pupils will engage in further field trips and exciting career based experiences under the Millfield's Trust 'Widening Horizons' scheme. 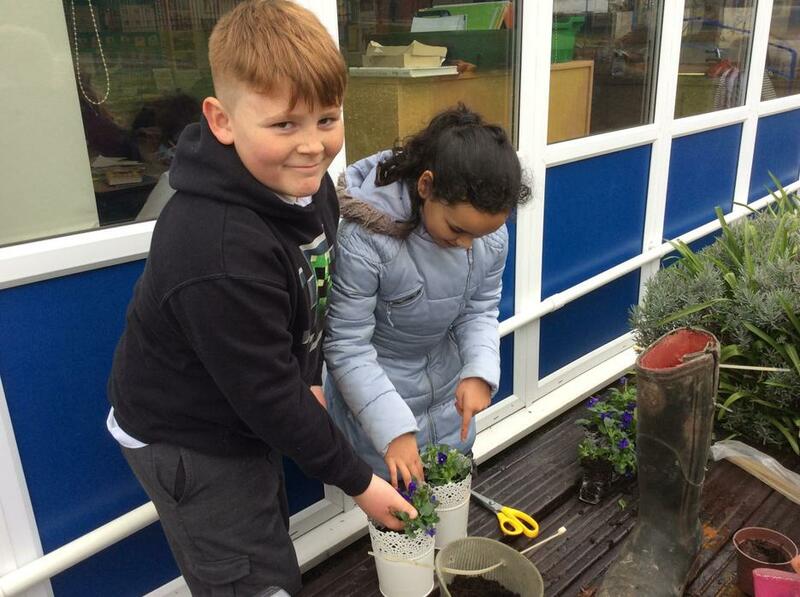 See our new Spring Term curriculum poster and letter attached for further details of coverage across all the subjects, together with our daily routine and expectations in Year 5. 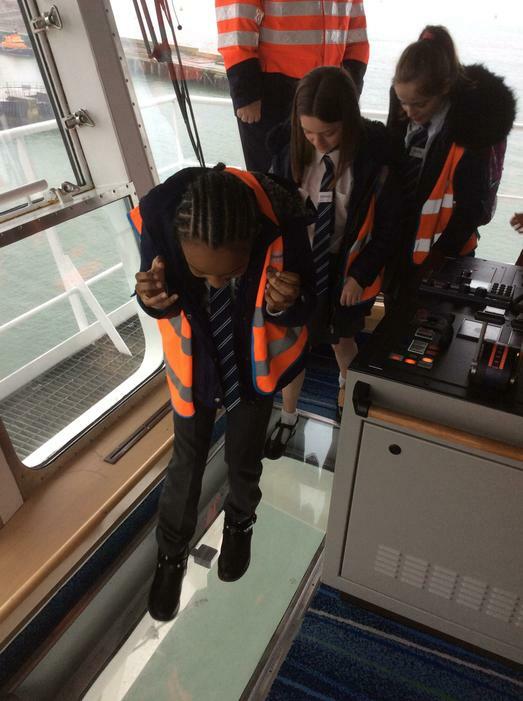 Taking one giant leap into a new academic year, Year 5 will explore the Earth, Space and Beyond this Autumn with Mr Napier commanding the helm, assisted by Mrs Duboisson and Mrs Dudley. 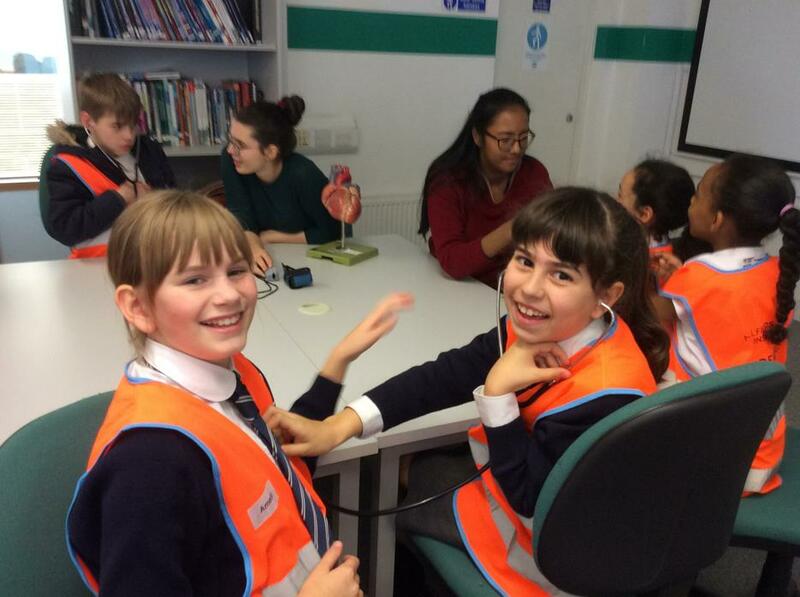 a voyage of discovery with the ancient Maya civilisations and are digging deep in world of biographies. 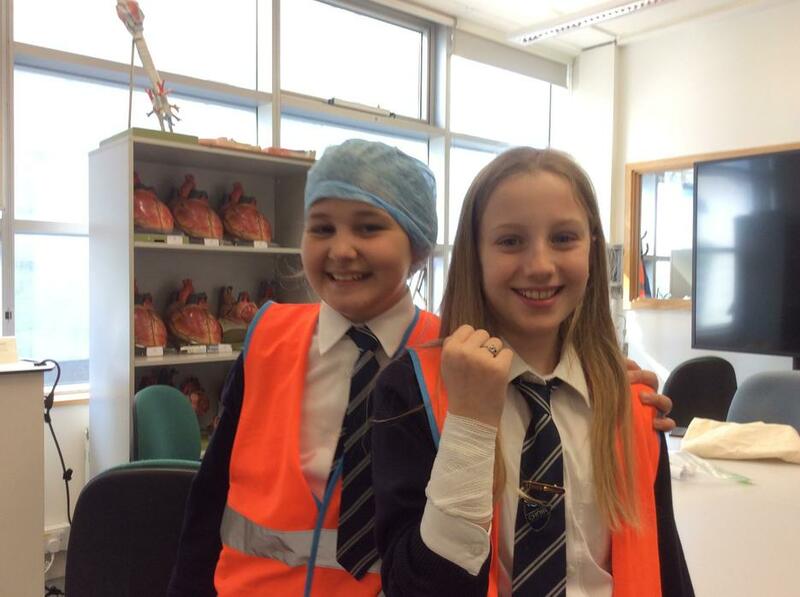 Soon our young scientists will aim to explore colour right across the spectrum! 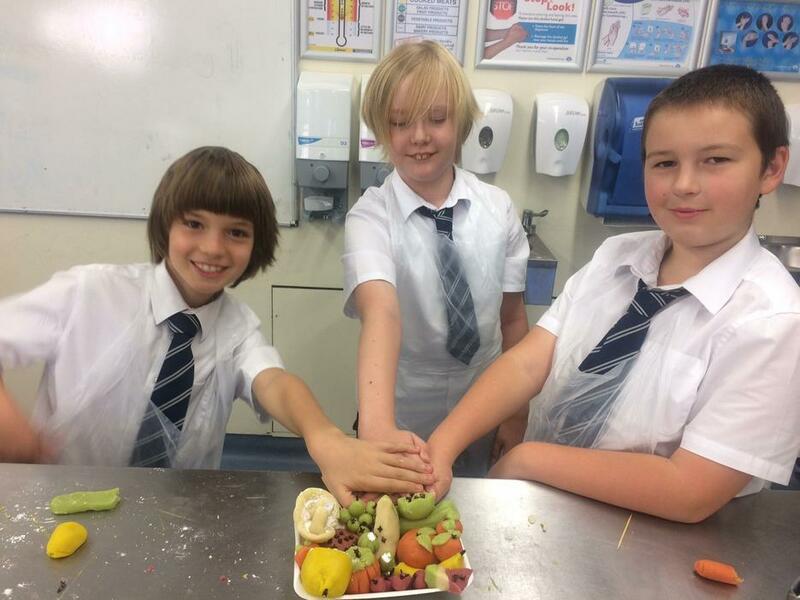 Everybody in Year 5 has returned from the Summer break all enthused and ready to challenge themselves, to build upon their personal strengths and embrace new experiences whilst fulfilling those targets set at the end of Year 4. 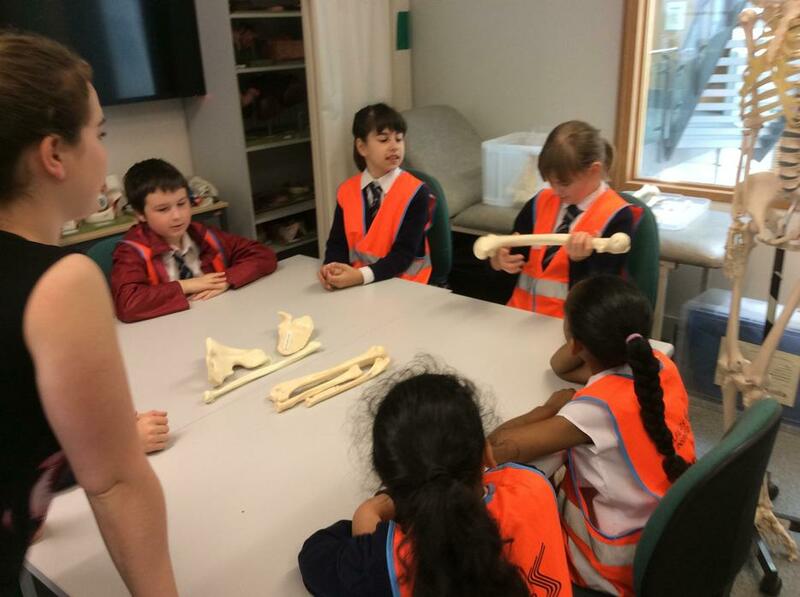 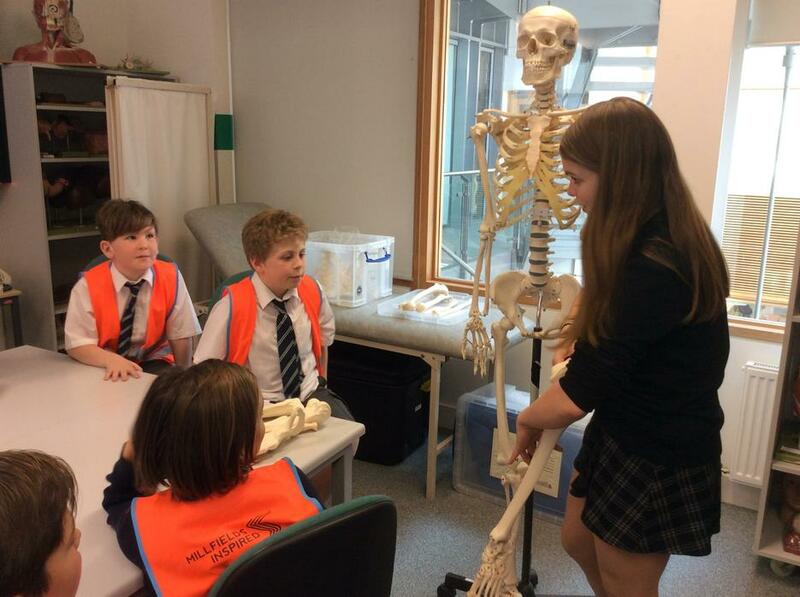 Year 5 will be an exciting year with numerous field trips planned under the ‘Widening Horizons’ banner, which give our class an insight and experiential learning about a wide range of future career opportunities. 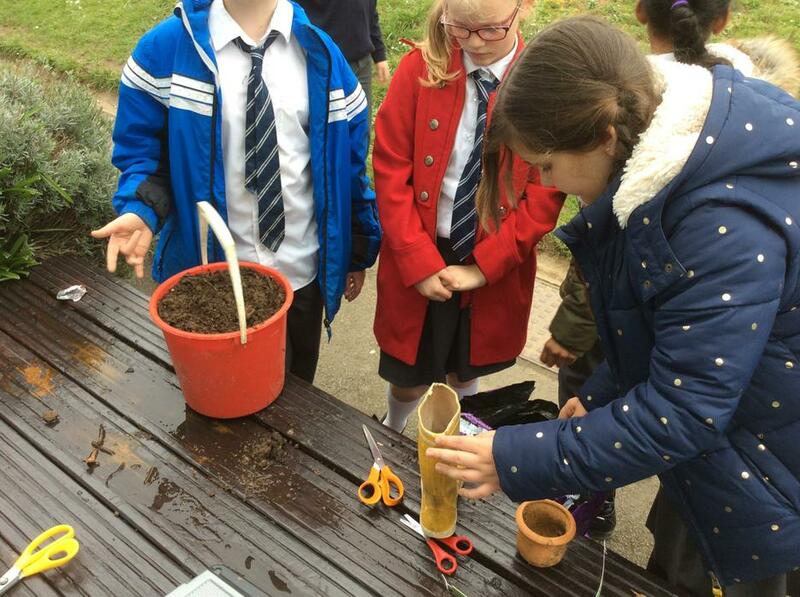 Please look at our Curriculum Poster and Curriculum Letter below for a more general overview of what Year 5 is all about – Keep your eyes peeled on this page for further progress and discoveries that our explorers embark upon over the next year. 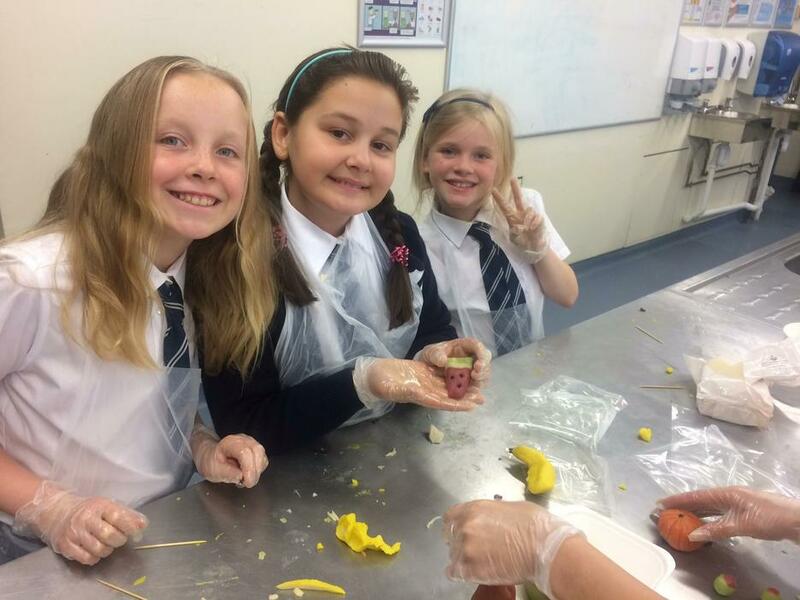 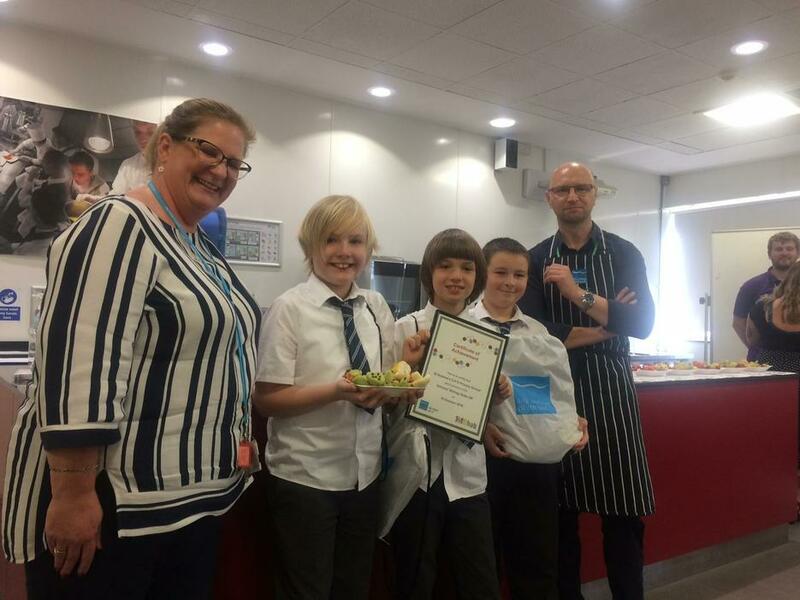 During this Autumn term, 6 of our class participated alongside seven other local schools in a 'Biology Bake Off' competition, that was organised by STEM at City College, Plymouth. 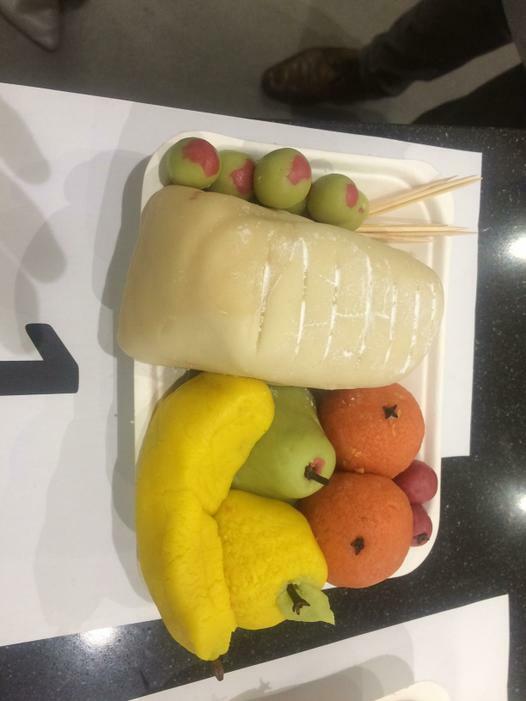 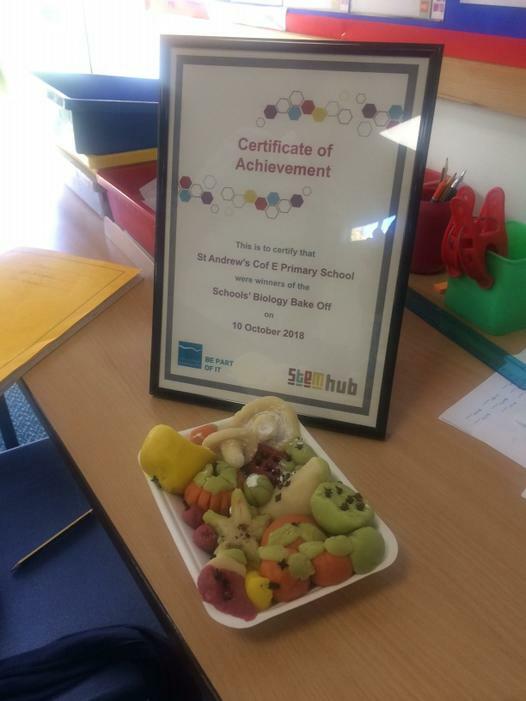 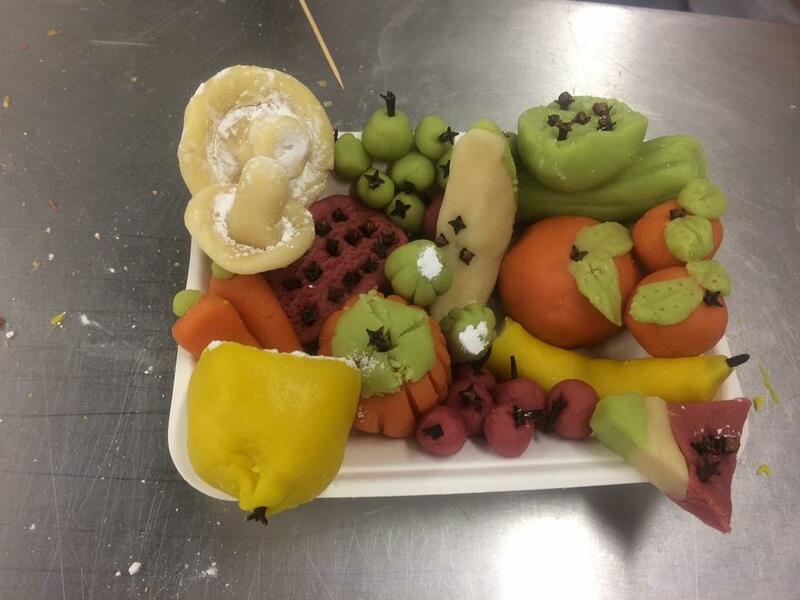 Out of 16 teams, a St Andrew's team proudly brought back the first prize for their creative skills in producing a mouthwatering platters of food made entirely from marzipan. 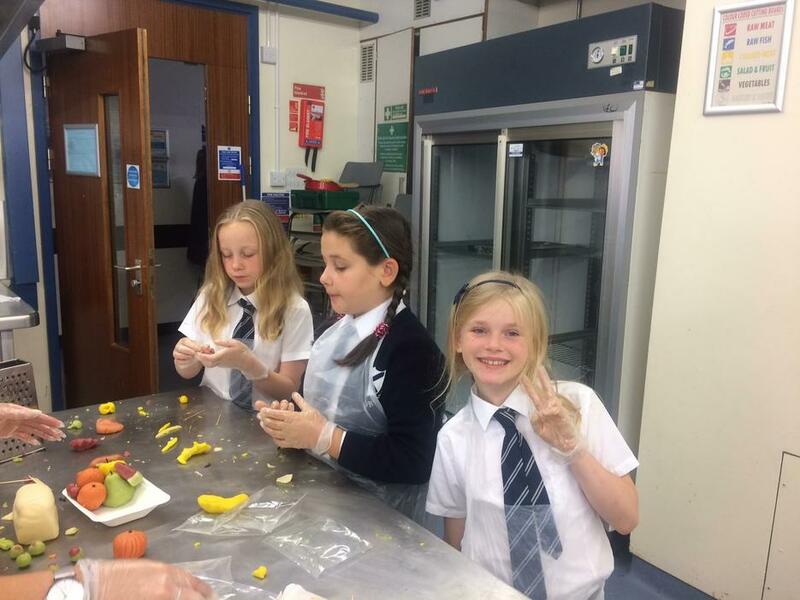 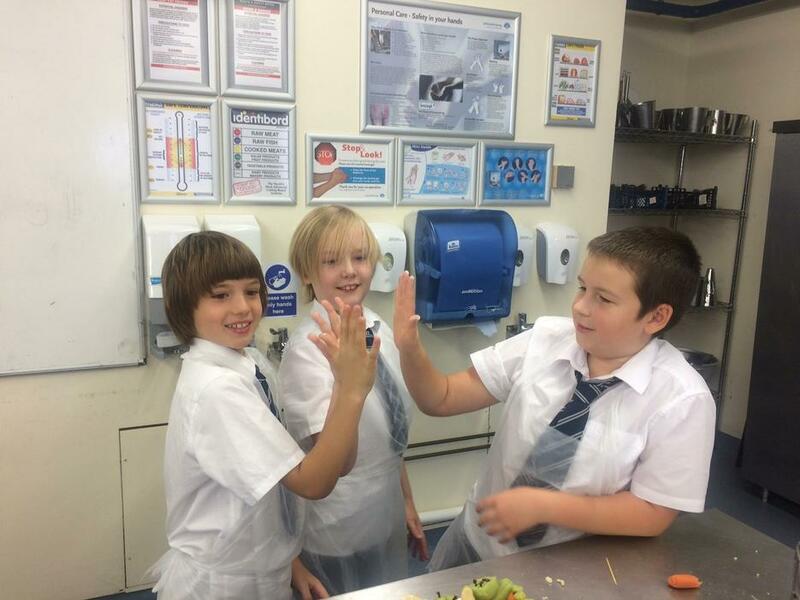 Our children really enjoyed themselves, especially showing off their teamwork and artistic skills, whilst working in a professional kitchen. 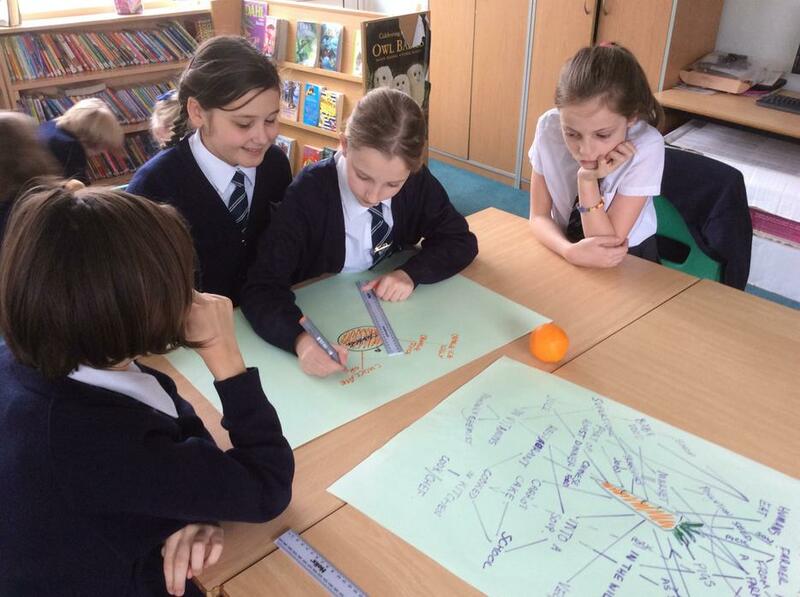 to express opinions, summarise, contest or build upon issues in a balanced debate during Literacy lessons. 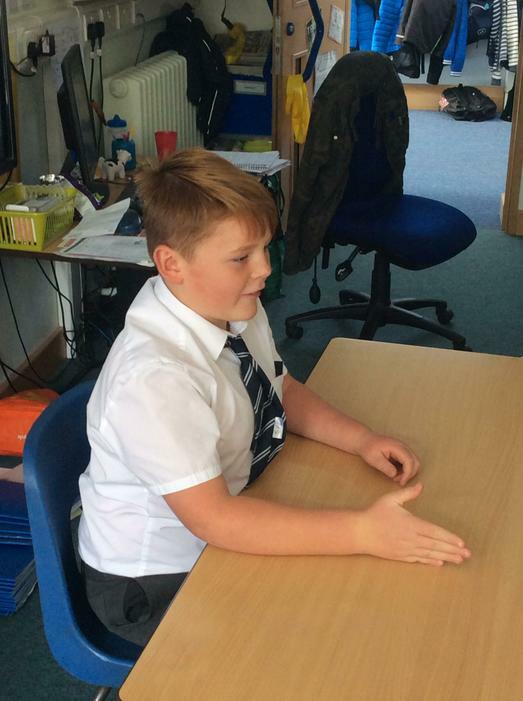 Likewise, we use Oracy to share feelings and support each other in PSHE 'circle time', combined withe confidence to deliver a Topic based research presentation or perhaps engage on a 'hot seating' role after a Guided Reading session.